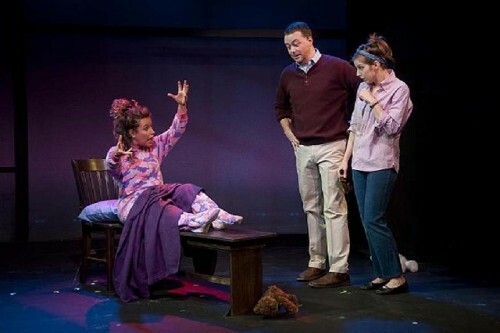 Dina Thomas is possessed as Becky as her parents, Emily Kunkel and Matt Neely look on. Kevin Sprague photos. John Zdrijeski as a son has differences with his dad Robert Zukerman. New Year’s Eve isn’t much fun in the nursing home. Another masterful performance by Peggy Pharr Wilson. During the dead of winter, for the past three years, Pittsfield has organized 10 x 10 a citywide festival of the arts. This year has been particularly challenging with back to back snow storms and no end in sight. Perhaps typically, for Valentine’s Day on Friday, when it was nasty outside, we hunkered down with an exchange of gifts, a fine meal, then snuggled on the couch watching the Olympics. On Saturday we cleared two cars and headed for Images in Williamstown and a matinee of the romantic film Her. Definitely a New Age chick flick. Deciding to have dinner in Williamstown, the day after Valentines, the restaurants were slammed. It took a drive out of town to get seated after a short wait. The point is that even in deep dark winter there are lots of local folks with cabin fever looking for a romantic night out. The annual 10 x 10 Upstreet new play festival at Barrington Stage, based on the past two years, has been a much anticipated winter highlight. That we attended during Valentine’s weekend is particularly significant. For artistic director Julianne Boyd, and her extended family of creative artists, the event is a gift to the community and truly a labor of love. It’s pretty intense to absorb ten, ten minute plays with an intermission. That broke down to Boyd directing four and then three each for artistic associate, actor/ director, Christopher Innvar, and the artistic director, Kristen van Ginhoven, of the emerging and ever stronger WAM company. The team of directors worked with a versatile cast that included Emily Kunkel, Matt Neely, Dina Thomas, Peggy Pharr Wilson, John Zdrojeski and Robert Zukerman. The rapid fire format is demanding all around. That includes the audience. Ten minutes can be a lot or a little time. It can fly by in a flash when you’re engaged and having fun and seem like an eternity when out of synch and disengaged. In this incarnation of the festival there was a lot of the former and a bit of the latter. Just like the Olympic events we have been absorbed in a lot depends on getting a fast launch out of the box. It is absolutely imperative that the audience is immediately engaged. There are just seconds followed by too few minutes to establish a situation and clearly delineate the characters. That also entails super crisp writing and sharp directing. When executed flawlessly a lot of information and entertainment can be crammed into just ten minutes. In this tight and unforgiving format the leadoff piece, or launcher, is essential. The choice of The Possethsion by Ron Burch, directed by Boyd was a truly perfect decision. We were utterly enthralled by the truly gifted Tina Thomas as a bratty, sleeping teen who wants to hook up with friends, and what else, shop at the mall. Her parents played by Emily Kunkel and Matt Neely, natch, have other ideas. Then the teen becomes possessed by a demon switching back and forth with hilarious results. We just loved Thomas in another short Uh-Oh, by John Cariani, directed by Innvar, when she plays Mary, so bored by a year of marriage, that she threatens to off her flabbergasted husband Bill (John Zdrojeski). She also took a turn in the anchor slot of the evening in Sweetheart Roland an ersatz fairytale send up by James McLindon directed by Boyd. Let’s hope that the wonderfully gifted and versatile Thomas is adopted by the Barrington family. One such individual is the redoubtable Peggy Pharr Wilson who is readily familiar for her many roles at Barrington. We were particularly enthralled by her emotionally riveting solo turn in Lost and Found by Gewndolyn Rice directed by Innvar. The brief encounter packed in a lot of information and an amazingly diverse and complex character and situation for such a thumbnail. It explored Sarah’s complex relationship with her father, an attorney, whom she aspires to be just like. She attempts to communicate with him but he’s out of it with Alzheimer’s. Briefly we find in this unfortunate aspect she is showing signs of being just like him. It was a too brief and stunning moment. We found the staging of Debridement by Megan Dieterly, directed by van Ginhoven, to be static. The characters Jake, a stressed Emergency Room intern (Matt Neely) and the multi-layered Eloise (Emily Kunkel) stand and deliver their lines. There is a gaping empty space between them. They never even look at each other. The evolving narrative, however, makes an ever more poignant, and tragic connection. Within its allotted minutes we find ourselves emotionally shattered. The three directors used their compact company to its best advantage. We liked the aspects of the wonderful Robert Zuckerman as a father with a troubled son in I Love You by Lynn Rosen, and a beggar who offers to tell his life story for twenty five cents in Homeless Romantic by Scott McCarrey. In New Year’s Eve Zuckerman rocked the house as a foul mouthed, raucous resident in an assisted living center. He makes the best of David MacGregor’s crisp and salty lines. In New Year’s Eve directed, by Innvar, he is paired with a nurse Laura (Emily Kunkel) who wants to help him celebrate. But, as he aptly points out, it’s minutes to noon and midnight is some twelve hours off. So the curmudgeon is not in the mood to doff a silly hat or blow a noise maker. Kunkel had some wonderful comic timing in responding to his over the top performance. We have focused on highlights and strongest impressions of the two hour performance of ten very different plays. Such a dense immersion tends to blur the edges of the experience. It’s just not possible to be locked and loaded, fully engaged with each and every moment and nuance. Like speed dating not every brief encounter evolves into a relationship. But there were definitely individual writers and actors in this fast paced mash up that we would enjoy meeting again and again. Hey Barrington. You’ve got my number. Call me and let’s hook up. This was such a hoot. Man the Torpedoes by Suzanne Bradbeer. Astronomer Henry Wallner would rather disappear into a black hole than do what he has to do today: have a tough talk with his new assistant Anita. 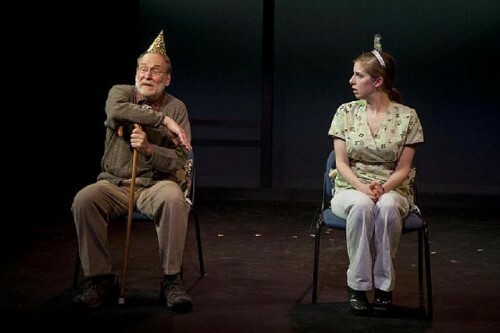 (Bradbeer was part of the 2012 New Play Festival with God in the Goat.) Julianne Boyd directs. The Possethsion by Ron Burch. When Ted and Becky's 12-year old daughter, Megan, becomes possessed by the demon Sethamungus, it's up to them to try and free her from him. Julianne Boyd directs. New Year's Eve by David MacGregor. It's New Year's Eve at the Parkview Retirement Home and the residents have gathered to bring in the New Year...at noon. While most of the retirees are happy with the festivities, one of their members is less than pleased. Christopher Innvar directs. Sweetheart Roland by James McLindon. A witch’s stepdaughter defeats her and marries her true sweetheart … well, after she figures out which of her sweethearts he is. 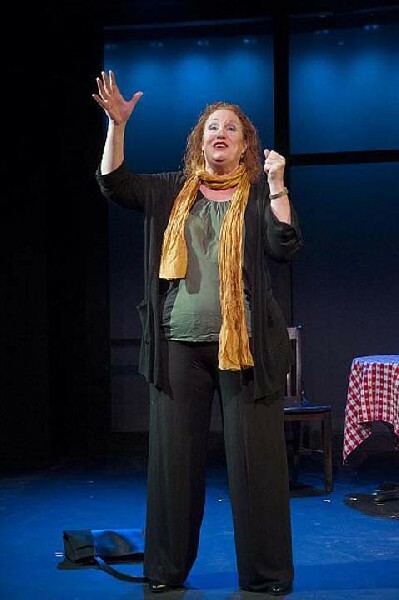 (McLindon’s play The Wilderness, was part of the 2013 10X10 New Play Festival.) Julianne Boyd directs. Lost and Found by Gwendolyn Rice. A middle-aged woman loses her car keys one morning and realizes that some things that are lost can never really be recovered. Christopher Innvar directs. Uh-Oh by John Cariani. Mary realizes that she is bored with the life she and her husband, Bill, have made together: it's not at all what she hoped and dreamed. So she takes some...surprising action and nothing will ever be the same. (Cariani was featured as ‘Dogberry’ in BSC’s summer production of Shakespeare’s Much Ado About Nothing. 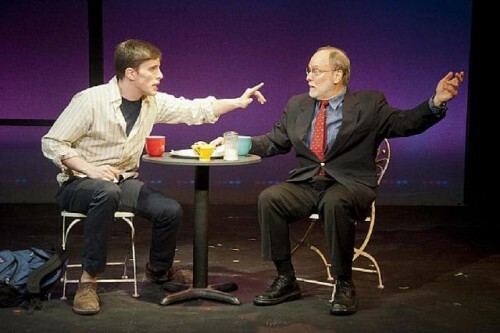 He is the author of the popular play Almost, Maine.) Christopher Innvar directs. I Love You by Lynn Rosen. A father and son long to say three little words to each other. But it's hard when sober coaches, vegan muffins, and a lifetime of recrimination get in the way. Julianne Boyd directs. Debridementby Megan Dieterle. A doctor and a young woman recount one day in which their lives merge, only to find they have more in common than they thought. (Megan Dieterle is Assistant to Julianne Boyd, and BSC’s Literary Associate.) Kristen van Ginhoven directs. Homeless Romantic by Scott McCarrey. Two vagrants meet on a city street at night, compare tales from itinerant lives, and share a dance. Kristen van Ginhoven directs. The Prompter by Jodi Rothe. A Picasso painting has a strong effect on a young make-up artist who tries to get on with her life after a harrowing encounter. Kristen van Ginhoven directs.